With #7 circular needles, CO 69 sts. K3 sts K1P1 rib across to last 3, k3. Keeping first and last 3 sts of every row in garter, work rows of ribbing, placing an optional simple YO button-hole on the the 7th row (by ribbing across to last 4 sts, YO, SSK, k2). On 12th row, inc 1 st.
*K to marker, make 1 by YO, place marker, k1, make 1 by YO, k across to next marker; rep from *. Eyelet set-up row: k3, *work eyelet lace to next marker, m1, k1, m1; rep from * finishing with the eyelet lace and the last 3 sts in garter. Now that you’ve set up the inc and the eyelet lace patterns, continue until the shrug is about 5-1/2” (and sleeve is about 52 sts); you will add eyelets whenever you have at least four sts between the yo for the raglan inc and the last eyelet. Split for fronts/back and sleeves by: work across 33, slide next 52 to holder, work next 60 (back), slide next 52 to holder, work across 33. Front and back: Working on the 33 + 60 + 33, keeping the first 3 and last 3 in garter, work in Mock Cable Eyelet over the 120 sts. Work 3 full repeats and BO on the WS. Break yarn. Sleeve: using dpns, move the 52 sleeves sts from holder to dpns. Join. Dec 2 sts evenly on next row. On 50 sts, work Mock Cable Eyelet for 3 full repeats (12 rows) and BO on WS. Rep for 2nd sleeve. Tuck in all loose ends (neatening up underarm where you did the sleeves). Sew optional button to left front opposite bh. 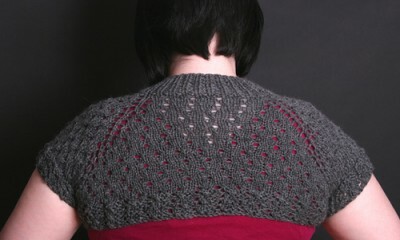 If you have any questions, comments or concerns about this pattern, please email me or PM me on Ravelry.